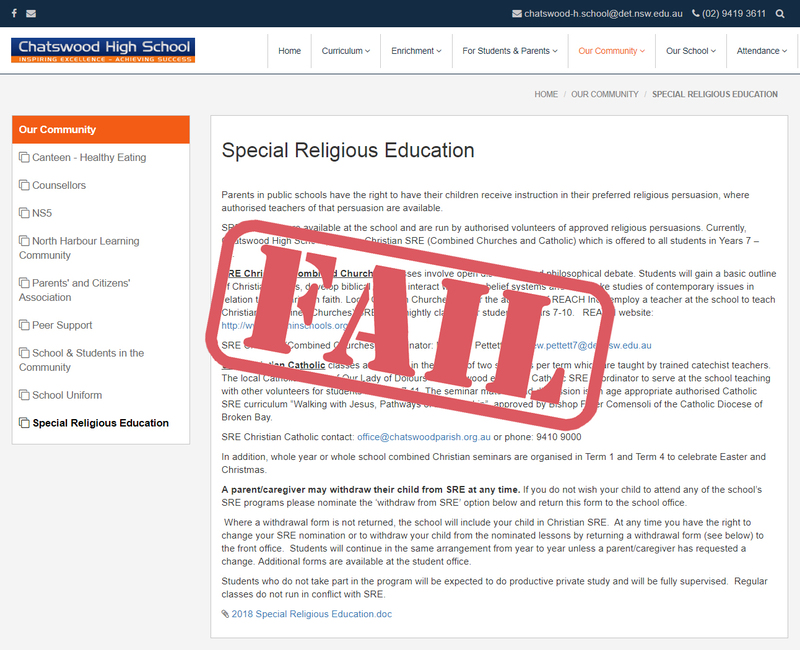 In the first of FIRIS’ NSW School Report Cards, Chatswood High School (CHS) gets an overall resounding ‘F’ for being a prime example of everything that is wrong about Special Religious Education (‘SRE’ aka ‘scripture’) in NSW public schools. When it comes to implementing NSW Department of Education (the Department) policies and procedures in a way which ensures the rights and choices of all parents are respected, CHS gets an ‘F’. Where a withdrawal form is not returned, the school will include your child in Christian SRE. Surely, after reading this statement, a reasonable member of the NSW public would be justified in concluding that CHS regards enrolment in scripture as an ‘opt-out’ process? It is most likely that the following of such a procedure at CHS in 2018 resulted in far-too-many violations of a child’s right not to be instructed in a religious belief contrary to the wishes of their parents, but it seems that the Minister, the Department, and the scripture lobby have no problems with that. After all, in our supposedly ‘Judaeo-Christian’ society what does it matter if the rights of those belonging to minority religions or those who have non-religious beliefs are trampled on. As one Newcastle Anglican Reverend and scripture instructor has said about the current enrolment process – SRE for the win. If the parents ⁄ caregivers do not return the letter, the student will engage in alternative meaningful activities during time allocated for SRE. 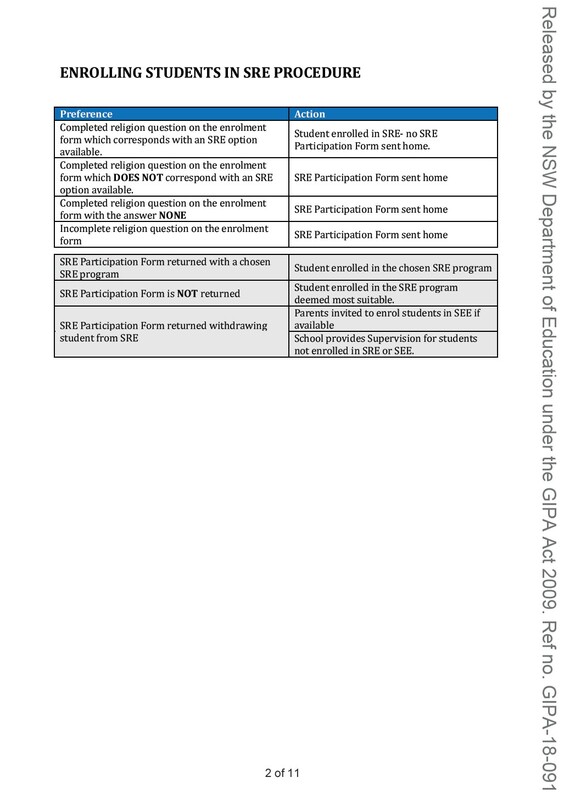 So it now seems that, ultimately, SRE is technically ‘opt-in’ because in the absence of information regarding a parent’s choice students should not be placed in a scripture class. However, this is where the Kafka-esque shenanigans begin. In alignment with the wishes of the scripture lobby, the Minister has ensured that the Procedures, as well as all of its supporting documents, do not contain or reflect his statement made above. FIRIS has seen no evidence that either the Minister or the Department has communicated the direction to principals of NSW public schools. 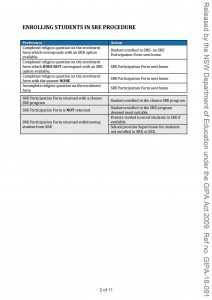 It seems that despite the Minister’s claims of respect for parental choice, including the choice to not have their children take part in scripture, a reasonable member of the NSW public might begin to suspect that the aim of leaving the statement out of the Procedures is to funnel students into Christian scripture classes without express consent from their parents or caregivers. Therefore, it might be possible to excuse CHS’s statement on its website and in its SRE participation letter, given that the Procedures provide no direction about what to do if a SRE consent form is not returned. However, in July this year FIRIS sent the Minister’s direction to the principal of every public school principal in NSW, including the principal of CHS. When it comes to demonstrating honesty and integrity regarding the place of scripture in the school, CHS gets another ‘F’. It seems that CHS is prepared to accept and facilitate many recommendations from the ‘how-to-embed-scripture-in-NSW-public-schools-and-blur-the-boundaries-between-evangelists-and-professional-teachers’ guidelines written by the scripture pressure-group, the Inter-Church Commission on Religious Education in Schools Inc. (ICCOREIS). teaching General Religious Education or other Board of Studies courses. According to the CHS website, the SRE Christian (Combined Churches) co-ordinator is Mr Matthew Pettett. Mr Pettett has a Department of Education email address provided on the CHS website (matthew.pettett7@det.nsw.edu.au) and is found on the school’s staff list under the heading ‘Religious Education’. 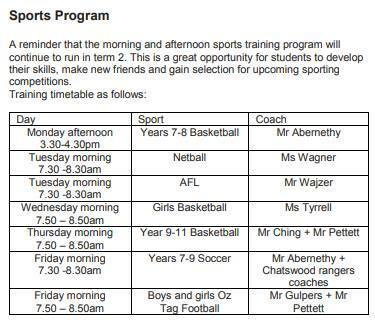 It also seems Mr Pettett is active in the school’s sports program. A parent or caregiver of children attending CHS might be excused for confusing Mr Pettett for a professional teacher employed by the Department to teach a subject developed by the state government education board, NSW Education Standards Authority (NESA). The blurring of boundaries between scripture instructors and professional teachers employed by the Department disguises SRE and increases the risk of contact between scripture instructors and students without the informed consent of parents/caregivers and without any policy direction preventing them from attempting to recruit students into scripture classes. Nonetheless, at the very least, a reasonable member of the NSW public might consider ICCOREIS’ recommendations above, particularly the statement that SRE instructors may teach GRE or other formal courses, as the pressure-group’s complete lack of respect for professional boundaries in NSW public schools and the choices of parents and caregivers who have not consented to interaction between scripture instructors and their children. 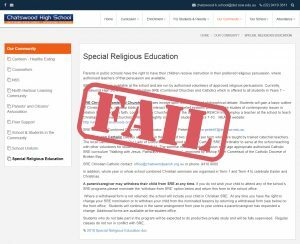 When it comes to preventing NSW public schools serving as ‘mission fields’ for Christian churches, CHS also gets an ‘F’. The seeming failure of CHS to act with honesty and integrity regarding the place of scripture and the position and status of Mr Pettett in the school may easily be regarded by a reasonable member of the NSW public as an intentional failure to preserve the secular nature of NSW Government schools. Mr Pettet is identified on the website of Willoughby Park Anglican Church as a ‘mission partner’ in reference to his role as the scripture instructor at CHS. Mr Pettett’s ‘SRE employment board’ REACH (referred to on CHS website) is identified by Willoughby Park Anglican Church as a mission organisation supported by the church. Our Lord Jesus said, “I am the way and the truth and the life. No one comes to the Father except through me.” For this reason, we want everyone, everywhere to know Jesus Christ, and so we gladly support mission beyond our church. Our church’s involvement in mission is in joyful obedience to this call…All members of Willoughby Park have an obligation to pray or serve in some way with the shared goal of the spread of the gospel to all nations and people. Picture walking into a classroom full of children who have never heard about Jesus and taking a government-endorsed half hour to tell them all about Him! Scripture provides an excellent opportunity to take the living and active word of God to children throughout our city. As Jesus said in Matthew 9:37, the harvest is ready! Students are hungry and eager to hear God’s word! SRE changes lives for eternity – here’s proof! NSW is one of the few states in Australia with legislation that supports SRE. Schools are an open door to the gospel. A SRE Teacher is not just a teacher, but a government-endorsed evangelist! SRE also presents an excellent opportunity to connect with schools, children and whole families. Research reinforces that ministry to children is an effective and powerful way to grow the Kingdom! Primary school children, those aged 5-12 years are NINE times more likely to accept Christ as their Saviour than people 12 years and above. When it comes to transparency and accountability regarding scripture in the school, CHS gets another ‘F’. Mr Pettett is referred to on the school’s website as the SRE Christian (Combined Churches) co-ordinator. SRE Christian (Combined Churches) is also identified on the school’s website as REACH Inc. and a link is provided to its website – http://www.reachinschools.org/. FIRIS assumes from this information that Mr Pettett is a scripture instructor supported by a ‘combined arrangement’. Religious persuasions may decide to provide a combined arrangement. If this occurs, each religious persuasion must be an approved provider of SRE in NSW Government schools. Despite the seeming simplicity of the statement, FIRIS has found that ‘combined arrangements’ are nebulous and unmonitored entities which create a ‘confusopoly’ benefiting Christian scripture providers. The combined arrangement at CHS is a typical example. The information provided to parents and caregivers of students at CHS directs them to the incorporation REACH. However, REACH is not an ‘approved provider’ of scripture in NSW public schools. The CHS website does not identify the approved providers forming the combined arrangement which supplies Mr Pettett as a scripture instructor to the school. The REACH website also does not identify the approved scripture providers forming the combined arrangement that supplies Mr Pettett to CHS. It does make reference to the ‘Combined Churches of Willoughby’, ‘a REACH Board, comprised of representatives from the Willoughby Ministers Association and supporting Churches’. However, none of these organisation are approved providers of SRE in NSW Government schools and little-to-no information can be found out about them on the internet. However, information regarding REACH and Mr Pettett is available on Generate Ministries’ ourSRE website, which identifies five Anglican and three unidentified-denomination churches, as well as single Baptist, Presbyterian, Uniting and Salvation Army churches, as ‘supporting churches’. However, both Generate Ministries and the Department of Education have made it very clear to FIRIS that the REACH board, as well as all of the other boards, associations etc. on the ourSRE website, are not combined arrangements. Therefore, at this point, it seems that it is not possible for a parent, caregiver or citizen to find out who the approved providers are that are responsible for the delivery of scripture at CHS without contacting the school and/or the Department of Education itself. However, recent attempts by FIRIS to obtain information from the Director responsible for the oversight of scripture in NSW public schools regarding other combined arrangements have not been fruitful. In fact, the seeming reluctance of the Director to answer FIRIS’ questions has resulted in a formal complaint from FIRIS which is currently being investigated by the Department. FIRIS will be writing to CHS and asking the school to identify the approved providers making up the combined arrangement. However, recent attempts by FIRIS to obtain information from principals regarding combined arrangements in other Sydney high schools have met with no response. Could it be a sign that no one knows what the hell is going on? If no one knows what is going on, the Department has a serious problem on their hands. SRE lessons in combined arrangements must be delivered by authorised representatives who are authorised by at least one of the approved providers within a combined arrangement. 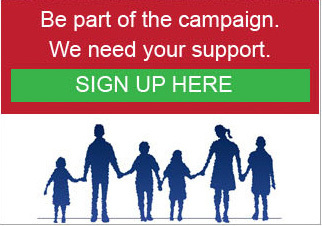 The biggest problem seems to be the lack of a centralised register of combined arrangements enabling principals, parents, caregivers and citizens to identify which providers are accountable to child protection legislation, particularly the monitoring of the Working with Children Check clearances of scripture instructors. The failure to establish and maintain a register results in a lack of accountability and significantly increases the risk of unauthorised adults entering NSW public school classrooms. No one connected to any of the combined arrangements FIRIS has investigated, including individual scripture instructors, has been willing to state who the member providers of the relevant combined arrangement are and which providers are responsible for monitoring the Working with Children Check clearance of the instructors. In addition, parents and caregivers need to know which approved providers are authorising the scripture instructor and the curriculum used in order to know where to find information, and where to direct complaints or concerns. The 2019 Procedures state that all scripture providers are required to have their complaints process available on their website. However, such a requirement is pointless if parents are unable to determine who the approved provider is. The curriculum delivered through a combined arrangement must be authorised by at least one of the approved providers. From 2019 onwards scripture providers are to make their curriculum scope and sequence(s) accessible on their website in sufficient detail for parents/caregivers and schools to be able to understand what is covered in SRE lessons. At least, it seems parents can learn from the REACH website that the curriculum apparently used by Mr Pettett is the Sydney Anglican’s Think Faith curriculum. Nonetheless, parents and caregivers are unable to determine who has authorised the use of this curriculum. In consideration of the child safety and age-appropriateness concerns regarding the Sydney Anglican’s Connect curriculum, FIRIS finds the limited information provided on the REACH website particularly concerning. FIRIS will go out on a limb here and assume, until told otherwise, that Mr Pettett is authorised by the Anglican Diocese of Sydney. Therefore, FIRIS will assume that students enrolled as ‘Anglican’ or ‘Protestant’ may be enrolled in Mr Pettett’s scripture class. Given the absence of any other available information FIRIS will also assume that the denominations identified on the ourSRE website are possibly approved providers forming part of the combined arrangement. Therefore, FIRIS questions whether all of the reported 400 students attending scripture lessons provided by REACH’s scripture instructor are there with the express of consent of parents and caregivers. Enrolment data does indicates that 155 students were enrolled as ‘Christian (Other)’ but, according to the Procedures, these students should not be enrolled without knowledge of which specific Christian denomination the students belong to. If the denomination is not known it cannot be guaranteed that the rights of students are being protected and that students are being instructed in accordance with the wishes of the parents. FIRIS will monitor CHS’s implementation of the new Special Religious Education Procedures which commence implementation on 30 January 2019. We will continue to try and determine the approved providers connected to the delivery of SRE at the school.